For as long as we’ve been living in this house, I have disliked our kitchen. I didn’t like the color of the cabinets, and the copper accents all over didn’t really go with the rest of the house (drawer pulls, pot hanger, etc). While we worked on the rest of the house, replacing the kitchen wasn’t in our budget. But painting the kitchen cabinets was. 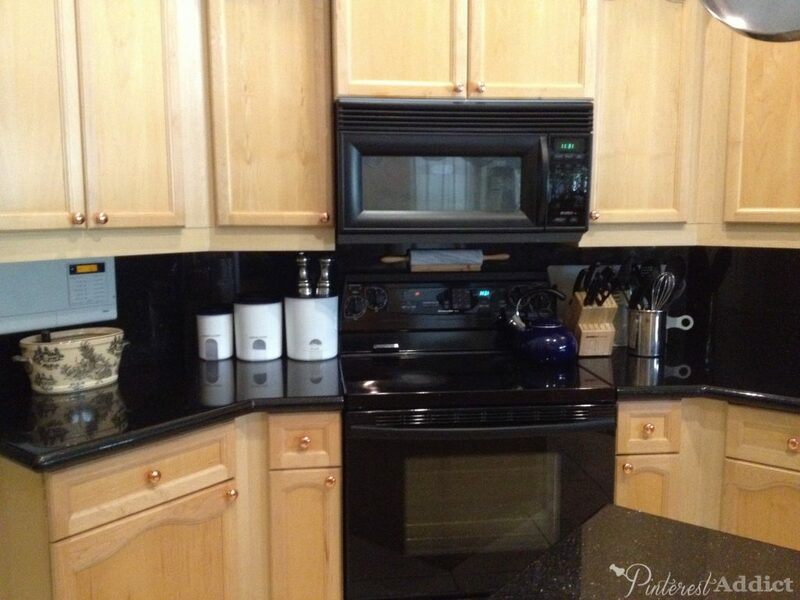 I was especially not in love with how the black backsplash and the black counters made it look like a black hole. As much as I’d love a complete kitchen makeover – new cabinets, new layout, new countertops, etc – it’s crazy expensive. In an effort to update the kitchen without getting too expensive, over the last few years we have painted the walls SW Mindful Gray, the doors of the pantries were painted SW Tricorn Black, and I painted the backsplash with tile paint. And then, a few weeks ago, I just decided I’d had enough of the blah wood cabinets and decided to paint them! Sherwin Williams Snowbound on the top cabinets, Gauntlet Gray on the lowers. If you remember, I used Gauntlet Gray for the tiles by the front door and around the fireplace. It’s the perfect gray for our house because it’s a big more of a beige-gray. We have some beige tile throughout the house that we can’t change right now, and this shade works with it perfectly. 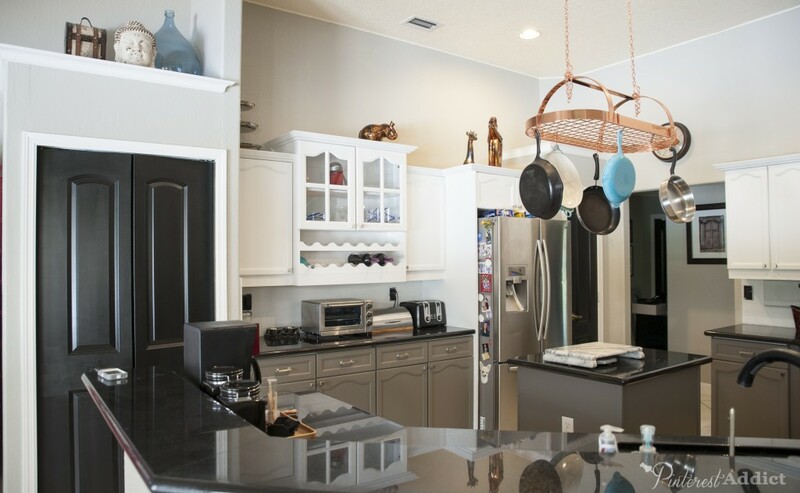 I love how the black doors look in the kitchen! Wider view showing black doors. We still have so many things we want to update in the kitchen. Stencil the backsplash – trying to decide on the pattern. There are so many to choose from! Replace (or repaint) the pot rack. Add the plate wall above the cabinets using the massive pile of silver platters and pretty plates I’ve accumulated over the last few years. We have to change out the black plug outlets and faceplates with white ones. Even though there is so much left to do, I love the difference just painting the cabinets made to how the kitchen feels. What do you think? I have the same maple cabinets in my kitchen, and I HATE them! I have wondered if I could paint them, and I see now that I can. Thanks for the inspiration! As for the copper pot rack, have you tried Rustoleum’s hammered metal paints? You might try painting the pot rack with that. They have one I like in particular that is black. It would probably look good in your kitchen. Just a suggestion. Gorgeous! I love the White/Gray combo! Wow, what a difference! I love that Gauntlet Gray! Our new house has some seriously outdated tile around the fireplace. I’m definitely going to have to get your advice on painting tile! I love it, just a thought maybe paint the pot rack silver or black? Did you have any problem with paint adhering to laminate? Yes! I had to sand them first, then prime them with Zinzzer primer and then paint them. Even after all that, there are still a few sections that have already chipped! I have to go back and do those parts over, and maybe sand harder before repeating the prime and paint steps. Buy a cheap large bottle of nail polish, pour it out and save the bottle. Put some leftover gray or white paint in it to use for little touch-ups where needed later on. Finally getting around to reading again…I LUST LOVE THIS! I was just mentioning to a friend here in Winston that she should try gray on the bottom and white on top–now I have something to show her! I have used Rustoleum on metal and it is worth a try. Thanks, Kirby! Do you think the Rustoleum would hold up to the wear and tear on the hooks? I’m tempted to give it a shot. I was thinking about the pot rack. If you did paint it in a hammered iron or black, then bought black hooks and slip a plastic sleeve over the hooks where they meet the painted copper, maybe that would protect against chipping. 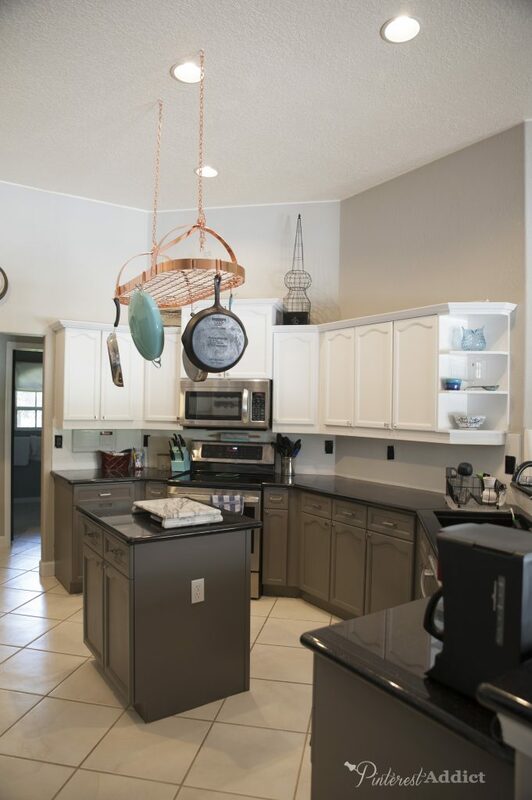 You have wonderfully high ceilings- a wrought iron sculpture would look awesome above the white cabinets, I think. I wonder if you could repurpose something to give that look. Anyhow, great job! Both are excellent ideas! The more I look at new pot-racks, the more I think painting it would be a better option. (I’m cheap, what can I say?!) And I don’t think I have enough silver platters to fill both sides of the wall. There is a pretty great salvage yard around here – I think I’ll stop by and see what they have! Thanks for the idea!! Is that a copper pot rack? If so, those aren’t cheap! 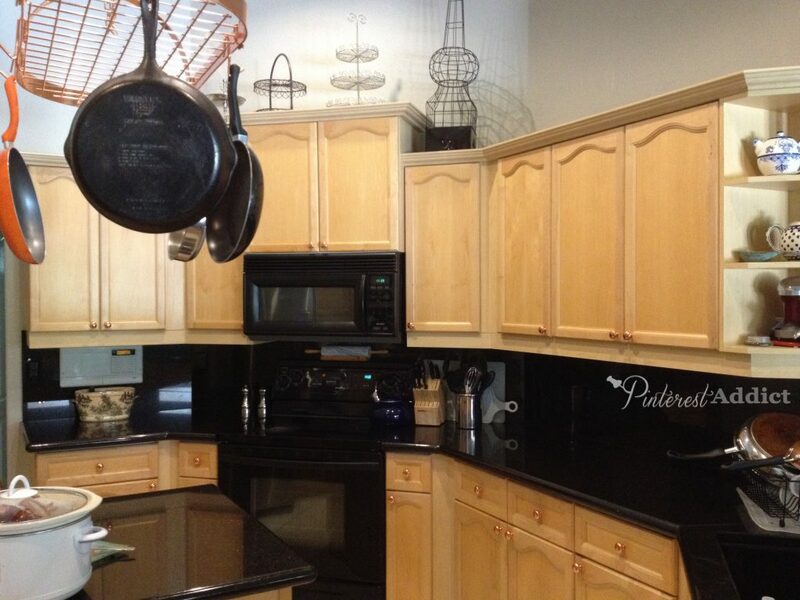 I’d sell it…………black pot racks are inexpensive….you might even make a little profit! I was just wondering several things: 1). What type of Sherwin Williams paint you used? 2.) Did you use latex or Enamel? 3.). Did you roller, brush, or spray them? 4.) What finish is that? Thank you for answering my question for me:). I am off now to Sherwin Williams to buy some paint!!! Your transformation is wonderful and I know it took a lot of elbow grease! May I suggest you just paint the switchplates on the white backsplash? I always paint the switchplates the same color as the wall paint so they just disappear from view and do not jump out as these things on the wall…much more cohesive and blended….I also did not know you could paint tile….! I’m worried about gunking up the outlets with paint… Yes! You can totally paint tile. Ours is still holding up fantastically! I don’t know if the Rustoleum will hold up with the metal scratching them and the wear they’ll get. I used the hammered silver on my towel hooks and, though it’s taken 6 years, the ugly brass is starting to show through in some places…and that’s with soft cotton towels. 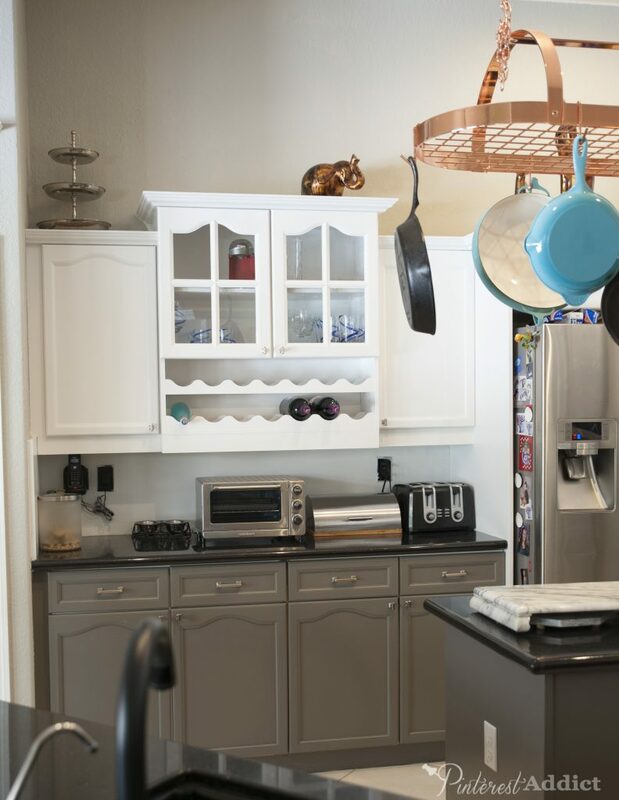 Can you share your process on painting the cabinets? There are so many different opinions out there. Also what white did you use? Thank you! 4. Primed with Zinzzer primer. 5. Painted with SW semi gloss. 6. put new hardware on. The only thing I would do differently is to sand the areas around the drawer/door pulls more – with a larger grit – because they are laminate. They don’t hold the primer/paint as well as real wood would. 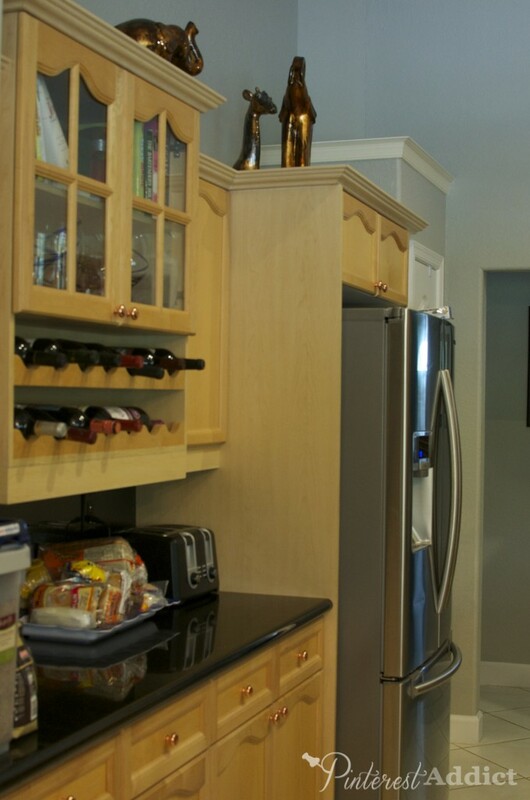 Oh, and I used Sherwin Williams Snowbound on the top cabinets. It’s what I have used on the trim though out the house. What a stunning transformation! I love your two-toned color scheme! I may have to copy this! We close soon on a house with a really tired kitchen, so I’ve been on the prowl for ideas 🙂 Thanks so much for linking up at Thursday STYLE. Pinned! I love it! It looks so much larger and bright. Thanks so much for linking up this week to Thursday S.T.Y.L.E. 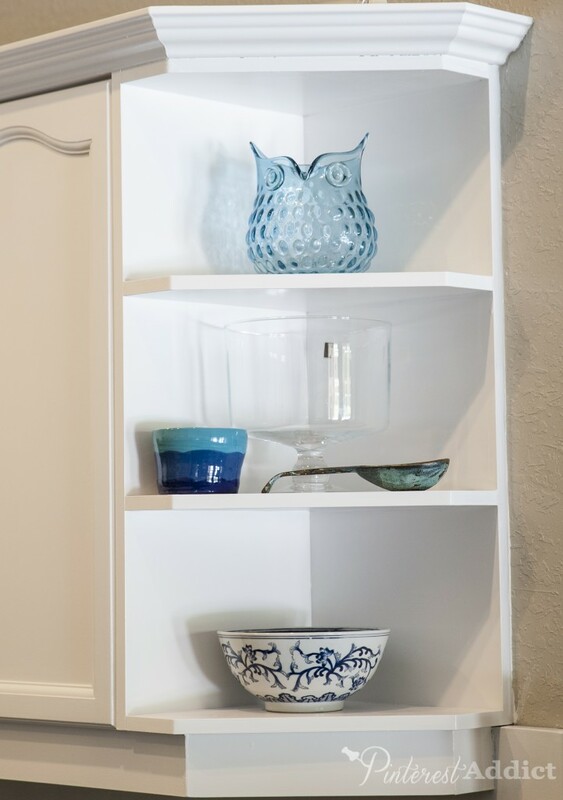 I love your cabinets and the two-toned look! 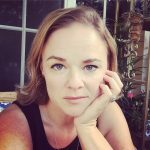 I just found this blog and I am loving it. In this one post you are answering a ton of what I want to do in my very dated kitchen. Just another question. I have those very old ” plastic ” tiles do you know if those can be painted? And if so how? Thanks for your I great blog. I know there are paints that work on just about everything. I haven’t personally tried to paint plastic tiles, so the only advice I can give is to find the best primer you can. The primer can make or break a project. I’m glad I found this post. I have the same problem with my black granite backsplash. You did a great job and the kitchen looks very nice. I just want to know if you tinted the primer for the backsplash as you did for the tile and then use what kind of paint? Love the white/gray/black paint combination. What a transformation!!!!! Looks like a new kitchen for sure. Enjoy! Thanks for the kind words 🙂 I’m sorry, but I’ve never tried chalk paint on cabinets – and I haven’t personally tried to make it myself. There are a ton of posts out there that can tell you what to use. Good luck – let me know how it works out for you.